Braved my allergies (ha-choo!) to forge ahead on the Q-train towards distant lands unknown, with my trusty, archaeologically-inclined friend Kristin at my side. Our quest? Foodstuffs from Mother Russia - the Georgian region to be specific. Our destination? 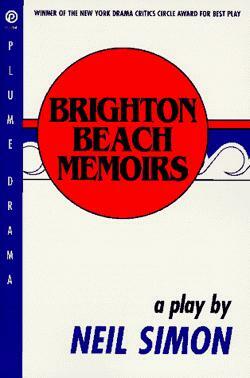 Brighton Beach, Brooklyn. Kristin had actually spent a good deal of time in Georgia a few years back, and was dying to get her hands on jarred tkemali (sour plum sauce) and adzhike (hot sauce) in particular. Stopping at a miniscule shop called simply Georgian Bread at 265 Neptune, Kristin found plenty - including a powdered version of adzhike that she plans to use as a dry meat rub. (Will it put Memphis Dry Rub to shame? I'm game to find out!) Well-equipped, with a small cooler, Kristin also purchased a half-pound of tasty-looking eggplant salad with walnuts and pomegranate seeds (badridzhani) and a wheel of sulguni (kind of like mozzarella). Unable to leave with out taking something for myself, I grabbed a jar of gorgeously stewed, deep ruby sour cherries. They seemed a perfect topping for a bowl of ice cream or a simple slice of pound cake. It might not have been an experimental pick, but I was sure I'd be pleased. Besides there was plenty of time to be adventurous. Unfortunately, our first appetizer adventure, the khachapuri (cheese bread) we ordered "for the road," was more like a greasy, gummy cheese croissant, than the "heavenly" leavened version that Kristin fondly remembered. Heaven or hell, we were hungry and even a lousy cheese croissant was looking pretty good to us. We washed the gooey stuff down with a chilled bottle of Jell-O green tarragon soda (tasted like Dr. Brown's Cream Soda) and set off to see what Brighton Beach Avenue had to offer. Now, temporarily sated, we could stroll around and make a better choice for our next stop. After a few blocks we happened upon a little spot on the avenue called Shish Kebob Cafe, which seemed like a good bet. Air-conditioned, sporting a large-screen TV displaying glitzy Russian disco dancers, and already filled with a few tables of Russian men three-sheets-to-the-wind, we were pretty sure that the experience would be authentic. During the communist era, people in the Soviet republics lined up at sidewalk kiosks to quench their thirst with kvas, a cloudy brown concoction with a similar texture and taste of dark beer, minus the alcohol...The drink used to be made from locally grown rye, beet sugar, yeast and stale bread. It had a short shelf life, so it couldn't be bottled and street vendors sold it by the glass.... Many fans of the drink say they preferred Soviet-era kvas because it tasted fresher and was more authentic. While quality may be open to debate, what isn't is the impact kvas has had on the regional drink market in recent years. After the Soviet Union dissolved at the end of 1991, Latvia's new health laws banned its sale on the street and post-Soviet economic disruptions forced kvas factories to close. For most of the 1990s, kvas virtually disappeared in this Baltic state of 2.4 million people. Coke moved in and quickly dominated the market with its popular carbonated soft drinks. Local drink makers struck back in 1998 by introducing a kvas that could be bottled and launching aggressive advertising campaigns. 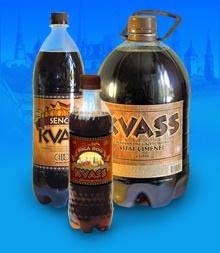 Kvas is also cheaper, at about 30 santims, or 48 cents, for a 1.5 liter bottle -- about half the price of Coke. In just three years, kvas rebounded to account for more than 30 percent of Latvia's soft drink market, market researcher AC Nielsen Latvia says. Coke watched its market share fall from 65 percent to 44 percent and had losses in Latvia of about $1 million in 1999 and 2000. Similar trends have occurred in the two other Baltic republics and in Russia. "Some older consumers shifted from Coke to kvas, which they became accustomed to during Soviet times," said Aki Hirvonen, Coke's Baltic marketing manager. Unable to beat the kvas makers, Coke joined the competition, or rather started buying it up. It purchased several kvas brands from the Baltics to Siberia, refitting some plants to produce kvas along with its standard soft drinks. Last year, for instance, Coke bought the most popular kvas brand in neighboring Estonia, where the drink is known as kali. Linnus Kali made 60 percent of the 8 million liters (2 million gallons) of kvas sold in Estonia in 2000. I must admit that I actually liked the stuff. It wasn't terribly sweet and had a rich, yeasty, brown bread note that was refreshing, served cold and fizzy. It would have been a crying shame to drink our kvas without some sort of nibble to go along with. Our first appetizer adventure was a bust. Perhaps this place could do better. We settled on an order of samsa, a savory little pastry, chocked full of spiced lamb. It was delicious. With a couple of Russkye appetizers and two exotic sodas under our belts, we were finally ready for the big time - Indiana Jones-worthy adventures. And, so, two intrepid gals, armed only with stylish sunglasses and a conspicuous lack of 80's-inspired hair and makeup, exited onto Brighton Beach Avenue and headed towards the Russian food pantheon of Brooklyn: M & I International.